In structural engineering we give names to different structural members based on their behavior under applied load. If the primary mode of transfer of load is by bending then the structural member is termed as beam. Beams generally carry vertical gravitational forces but can also be used to carry horizontal loads (e.g., loads due to an earthquake or wind). The loads carried by beams are transferred to columns, walls, or girders, which then transfer the force to adjacent structural members and finally to the ground. 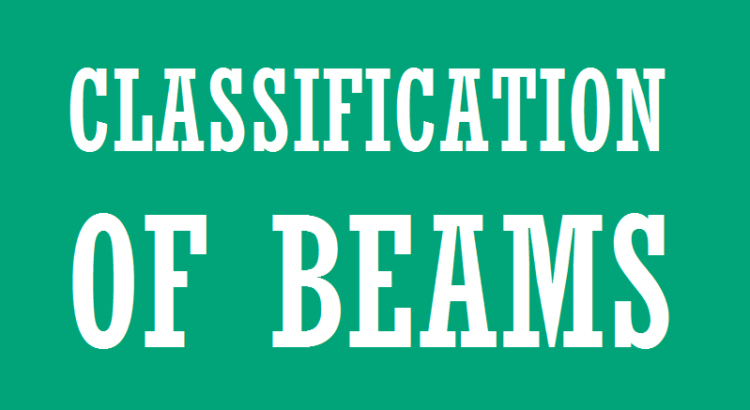 Beams are characterized by their support condition, profile (shape of cross-section),geometry, equilibrium condition, and their material. Classification of beams based on support condition is necessary because the bending moment acting on the beam is directly dependent on the support condition. You can see the variation in the following bending moment diagrams. For the same length and loading the bending moment diagram varies substantially with change in support condition. Simply supported – beams supported on the ends which are free to rotate and have no moment resistance. Fixed – beams supported on both ends and restrained from rotation. Over hanging – simple beams extending beyond its support on one end. Double overhanging – simple beams with both ends extending beyond its supports on both ends. Continuous – beams extending over more than two supports. The kind and magnitude of internal stress generated in the beam is directly dependent on the shape of the cross-section, thus requiring classification based on profile. The kind and magnitude of internal stress generated in the beam is also directly dependent on the geometry of the beam, thus requiring classification based on geometry. Statically determinate beams: equilibrium conditions sufficient to compute reactions.e.g. simply supported beams, cantilever beams, single and double overhanging beams etc. Statically indeterminate beams: Deflections (Compatibility conditions) along with equilibrium equations should be used to find out reactions.e.g. propped cantilever, continuous beams, fixed beams. Different materials have different pros and cons for their use as a building material for the construction of beams in terms of cost and usability, thus beams are also characterized based on material used for their construction.